Jeff attended the 20th annual GrassWorks Grazing Conference in January where he had the opportunity to hear Joel Salatin speak and to visit with him after his presentation on direct marketing. 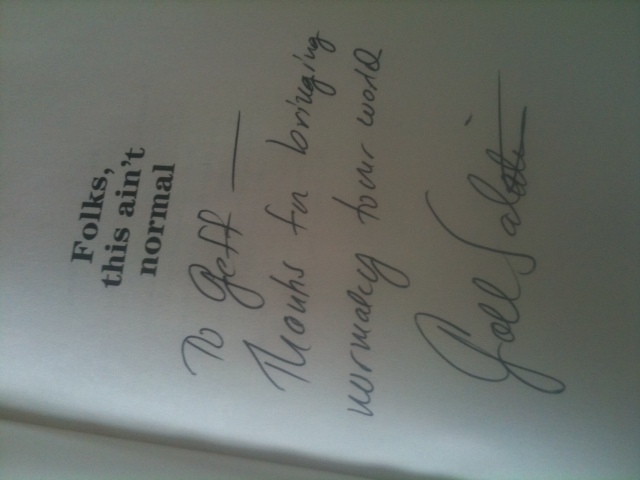 Salatin is hailed by the New York Times as “Virginia’s most multifaceted agrarian since Thomas Jefferson [and] the high priest of the pasture” and profiled in the Academy Award nominated documentary Food, Inc. and the bestselling book The Omnivore’s Dilemma. Jeff had a chance to visit with Salatin and hear firsthand about his direct marketing efforts and how he structures his farm internships. Contact us if you’re interested in a Crazy Rooster Farm internship. 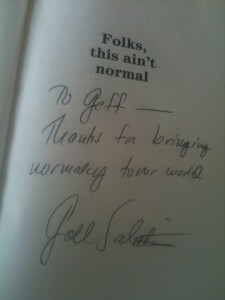 He also bought Salatin’s latest book, Folks, This Just Ain’t Normal. Jeff also attended workshops with Dr. Donald Huber, who coordinates the Emergent Diseases and Pathogens committee of the American Phytopathological Society. Dr. Huber revealed disturbing research showing the problems associated with the increasing use of glyphosate (Monsanto’s Round-Up) that has major implications for soil, livestock, food safety, nutritional quality and human health. “It’s always motivating and inspiring to spend time learning things with organic farmers and ranchers who are all working to improve their land and raise healthy, quality food for families,” Jeff said.